BestCare EMS provides quality, timely medical transportation services to our patients and providers with empathy and care. We understand the difference that a few seconds makes in an emergency situation. We also understand that comfort and care are important during scheduled, non-emergency transports. Our team works together, along with our medical partners, to help make the journey as comfortable as possible for you and your loved ones. 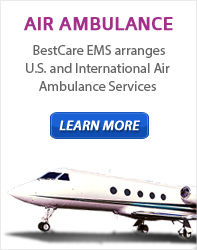 BestCare EMS provides a comprehensive range of emergency medical services. Our medical transportation units are available 24 hours a day & 7 days a week. BestCare works to respond as soon as clinically appropriate to all ambulance service requests. We are committed to providing superior service to our patients and communities.